Classic styling and popular for their reliable performance, these perforated backless benches offer a wide variety of installation possibilities with lengths ranging from 6', 8', 10' and 15'. 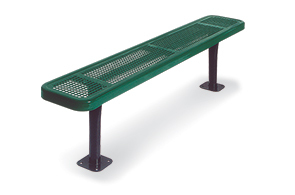 Designed for safe high volume use, the flat bench seats are constructed from 12-gauge precision punched steel with 5/8" hole perforated pattern, banded together with 11-gauge die formed edges. The portable, surface, in-ground and wall-mount frames are crafted with 2-3/8"O.D. round steel tubing to ensure top strength and durability. Combining all-steel construction and all-weather polyethylene finish, these popular backless team benches are built ready for many years of high quality service.